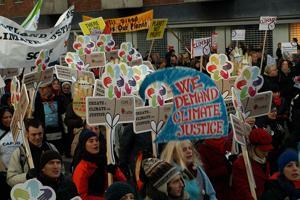 The Copenhagen summit on finding a climate change action plan has failed. World leaders produced a weak toothless deal that will not help the poor in developing countries deal with effects of worsening weather conditions. Read about how the Copenhagen deal does not move us forward in reducing global warming and safeguarding lives. The short-sighted approach to climate change means that the pressure must continue on developed nations. Caritas Bangladesh President Theotonius Gomes said, “Failure in Copenhagen puts the lives of millions of people in Bangladesh in danger. Read about how Caritas took the voice of the poor to Copenhagen. “Leaders must now set a firm deadline for coming to a comprehensive and binding agreement as soon as possible in the coming months, and we’ll be watching them every step of the way,” said Lesley Anne Knight. Caritas work to support the poor as the deal with extreme weather will of course continue, as will its advocacy on their behalf.